It’s time to start planning my new itinerary on this long, around-the-world journey of mine. I have now been traveling for ten months out of my four-year (48-month!) plan; so, I still feel as if I’m just getting started. In three weeks, I’ll travel to Murmansk, Russia, above the Arctic Circle; then to Arkhangelsk, St. Petersburg and Moscow. When my 30-day visa expires, I’ll drop down to Poland and other Eastern European countries, to wind up in France in mid-October to lead a workshop during my four-day InterVoice Conference in Paris. Then, to Vatican City in Rome. As soon as it gets too chilly in Europe, I’ll head to the Holy Land, to follow the desert footsteps of Moses and learn about the life of Jesus, right where it was lived. Then, on to Jerusalem for the holiest shrines of three of the world’s major religions, Judaism, Christianity and Islam; and, finally, to lovely Mt. Carmel, in Haifa, the World Center of the Baha’i Faith. Perhaps, my visa will allow six months in Israel? Certainly, three months. It’s been over thirty years since I made my last pilgrimage to the Holy Land, but I doubt if it has changed very much, as that land reflects thousands and thousands of years of history, both secular and religious. It’s where all hearts turn when they pray. 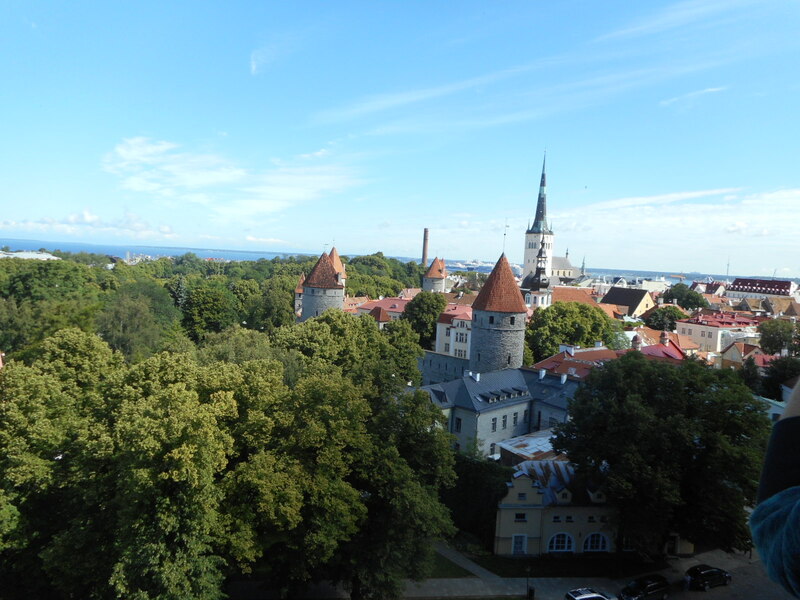 Interestingly, my random choice of Estonia was perfect to kick off this new portion of my world-wanderings because it is so old and yet, so modern. My seven weeks here is more than half over and I’m still loving every minute of it. The people are very friendly, kind, and welcoming. I’ve made some good friends and I will miss them very much when I move on. 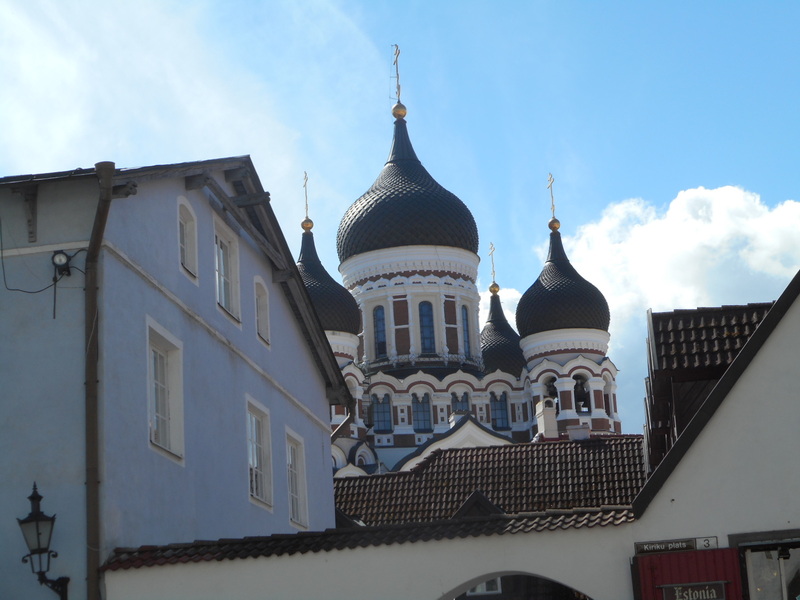 So far, exploring the medieval history of Tallinn’s Old Town has kept me busy, though I hope to run around the countryside of this darling country, too; before heading into Russia on August 20. I love to get lost here because I stumble upon so many fantastic museums, such as the new one depicting the Health and Well-being of the Human Body, devoted to the historical architecture of Ourselves, the occupants of this planet I’m circling. 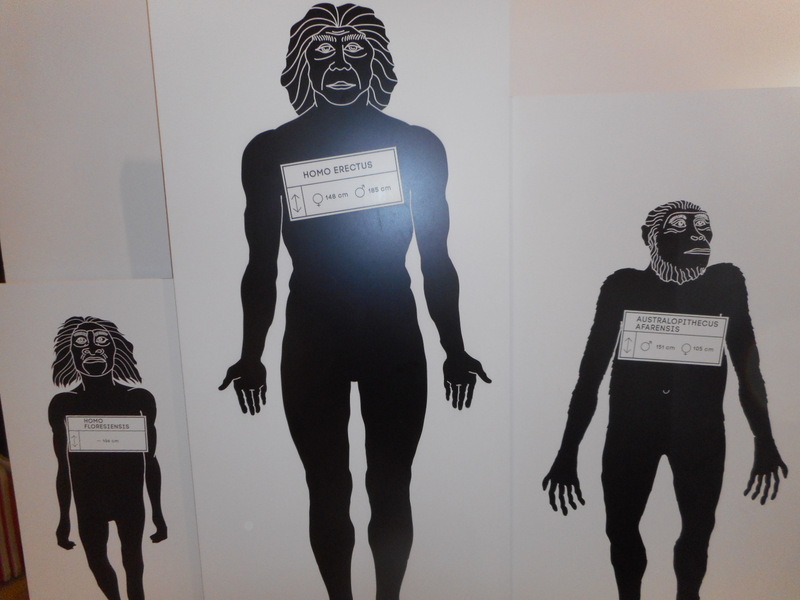 The evolution of our human family is thoroughly described in a new, award-winning museum. I learned so much about Medieval Days on our free, two-hour, walking tour. Just like Mankind, this town goes back a looooong way. 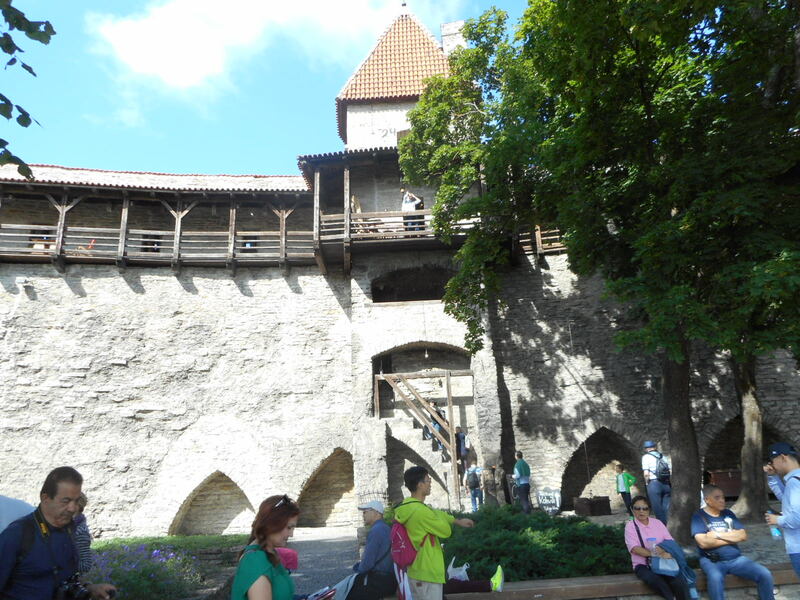 This was a walled city with ramparts and watchtowers and a general wariness of newcomers with strange ways and ideas. Not now! The whole country is so friendly! 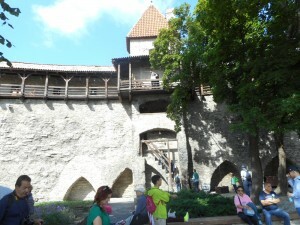 A part of the original wall as seen from within the city. An overview, with the Baltic Seaport in the background. Tallinn’s Old Town from the hilltop of its new town. Note the many steeples marking many lovely churches. 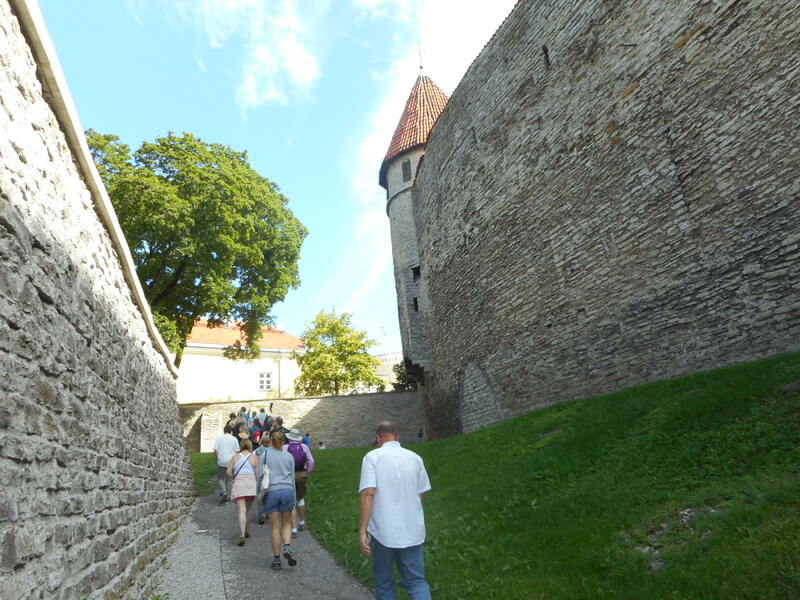 Our tour guide said that over the centuries, many foreign Christian missionaries had hoped to plant their version of that Faith deep in this soil, because the medieval people were Pagans. Thus, the many churches here……which are now serving as concert and lecture venues. Churches or not, those early proselytizers didn’t get very far in planting their staffs in this soil. Then came those ideological bullies marching under the dreadful leadership of Lenin and Stalin bent upon planting the ideals of Communism with slogans proclaiming power to the people! This entire Eastern European region was also shrouded for many decades under that Iron Curtain blanket of the Soviet Union, the USSR, which forbade all religions and closed all places of worship. Freedom of speech about spiritual or religious matters was, not only curtailed, but dangerous. 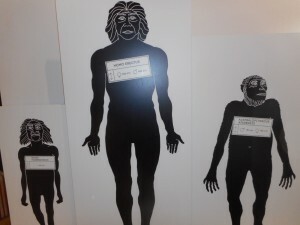 That repressive history is very hard for any present-day tourist to perceive or identify with. Everything here seems so normal; so Westernized. But, we have never lived under an Iron Curtain rule. We’ve always said whatever we liked, with no backlash, whatsoever. People of Estonia, Eastern Europe, and Russia were killed or sent to the gulag for doing just that. That is such a hard concept for us to wrap our minds around because, just within these few decades, the USSR has been relegated to sterile museum exhibits. I’ll visit a few of these and post my findings here. Like the prison where tens of thousands died, right on the edge of this town. I was within the borders of the Soviet Union while it was collapsing; but I didn’t witness that horrific behavior, personally, though I heard about it. 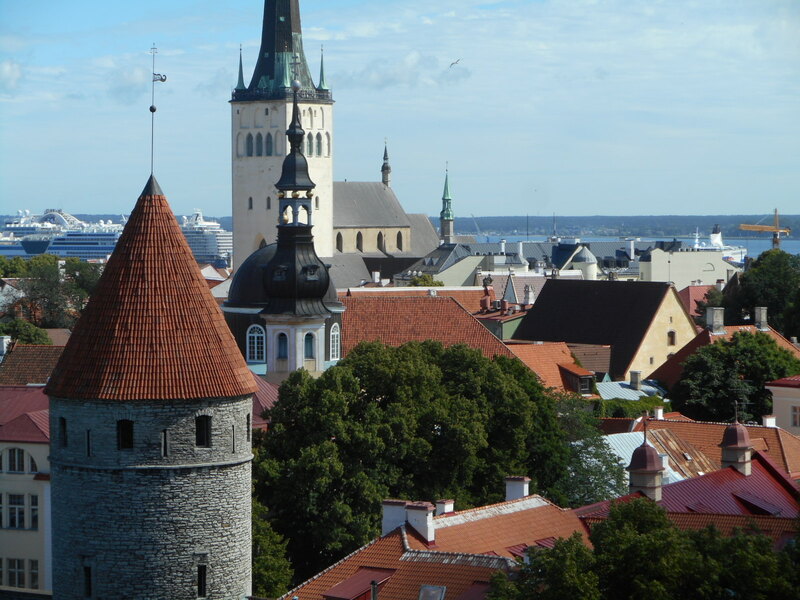 And yet, I can forget their recent past, when I walk through Tallinn now, during its beautiful recovery from that nightmare. It was my privilege to plan and lead Citizen Diplomacy Peacekeeping, grassroots group tours to Russia, Ukraine, and Siberia between 1990-1994, when things were still under the pall of the USSR. Though the feared Soviet Union was breaking up at that time, it was, actually, still in effect, and I was inside of the country on the morning that the hated dictatorship officially ended. Because there was no tourist infrastructure in those early days, we housed our travelers in homestays, which was so much more personal and fun than staying in hotels, anyway. I watched the excitement that our Soviet hosts felt when they could freely attend our group’s public, open meetings allowing everyone’s free speech during Women’s Forums, Spiritual Exchanges, and Entrepreneurial Business Conferences. They could pose their own opinions and questions and not worry about the KGB overhearing them. It was a very heady time for them. Trust me, they have some very good philosophies and deeply-held, personal spiritual beliefs that haven’t been strangled out of them by any wanna-be oppressor! I’m sure they’ll never let that sort of bullying repression happen to them again. 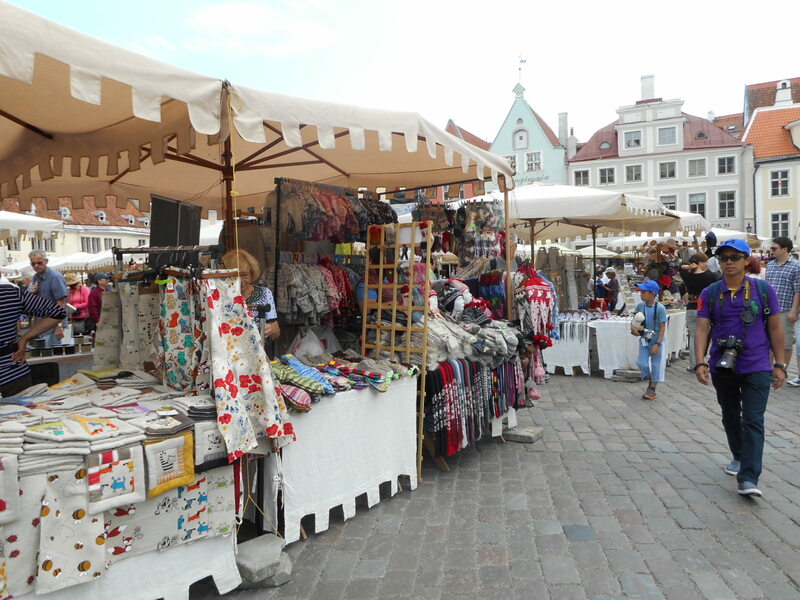 Estonians today are independent-thinkers, well-educated and intelligent. They’re among the most kindly and spiritual people on the planet, in my opinion. And, by traveling the world alone for so many years, my radar is wide-open to this rare quality.That’s why I’m looking forward to visiting all the Holy Places of every Faith. I want to find out exactly how their people behave and what kind of spiritual vibrations they have contributed to the earth’s atmosphere. Words are cheap! Actions are the proof of the pudding! “Let deeds, not words, be your adorning!” said Baha’u’llah, Prophet-Founder of The Baha’i Faith. …..with all of the world’s Teachings and Teachers who have come, throughout the centuries. It’s a great and peaceful example. They keep their own council but allow the same for all others! Pretty modern, I’d say!